The Twin in Berlin: Germany Is Awesome, Lübeck Is Gorgeous, Lots Of People, Lots Of Tourists. Germany Is Awesome, Lübeck Is Gorgeous, Lots Of People, Lots Of Tourists. Moin liebe familie and freunde! So I am feeling muuuuch better. But my poor Sister Murdock has sinus pressure that took its toll this week. we were in for about a day and a half. She feels so bad when we have to stay inside, but, alas, we are mortal. tis something that is sometimes out of our control. and to be the best tools in the lord's hands we have to be healthy and rested!!! Naja. thanks for your emails this week!!! they were solid. especially that stuff from prez eyering, momma. and that pic of you dad was really rad, dad. So this week was pretty good, in attitude at least! our STLs came on monday, and sister ter horst and sis murdock found someone together!! MIRACLE. we were fasting, and I know the Lord saw our commitment and preparation. haha ill have to tell you a funny story about our fast someday when i get back! our appnt with this guy is wednesday, im stoked to meet him!!!!! WOOHOO. Our other inv, Catherine, is suppper wishy washy and told us she doesnt want to be wasting our time. I LOVE HER. but to hear things like this is sooo harddd. she does read in the BOM daily, she says, heeeeey. I think a little break is good though, she can never really get her week in order to make time for us, so maybe she needs time to consider and ponder and get more humble. Yes we have been really honest about progressing in the past if you recall, when she is ready, she will be ready!! until then we will just keep supporting her and loving her. Oh man I love catherine!!! Germany is awesome.Lübeck is gorgeous. Lots of people. lots of tourists. it snowed a few times this past week, which was pretty. otherwise its rainy and pretty chilly. i love seeing old people on bikes and taking strolls during the day. sooo entertaining. Germans are polite, and very honest. love the honesty part the most. eat a lot of meat and potatoes. and rotkohl. I LOVE ROTKOHL. bakeries on every corner here in the city. what a life!!! the most occurring shops here are the hair salon, die fahrschule (driving school) und die Bäckerei (bakery). looooove me some german pastries. The transfer is half over already!!! I really want to stay here another transfer, with sis murdock. we are loving it!!!!! best thing this week happened yesterday. a less active sister in the ward had a birthday on friday. we had visited with her once or twice before, and seen her at church a few times. so we took her a birthday card last night. right after we gave it to her, she said, in german of course, " hey I need something from you." and of course as missionaries who live to serve others we were like YES OF COURSE ANYTHING. haha she asked for a Book of Mormon to give to some dude she works with, I think. IT WAS AWESOME. good thing this prepared servant had one on hand to give to her. 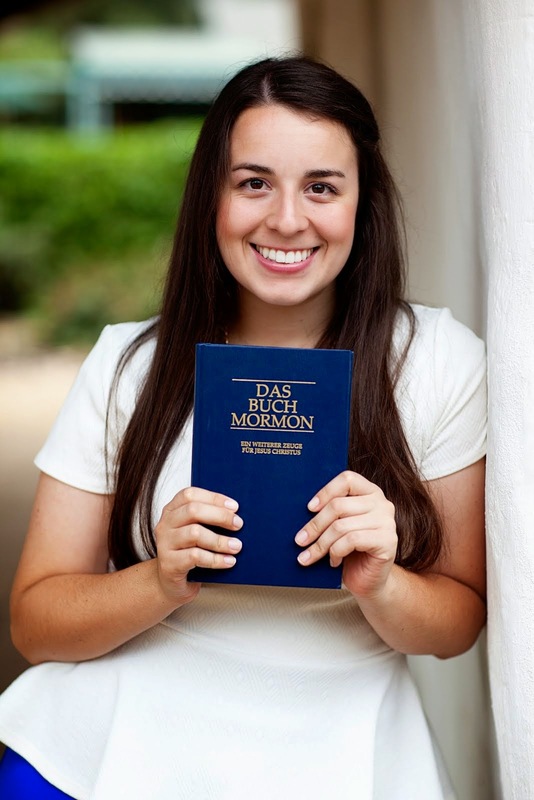 we made an appnt with her to come "practice our german" by teaching her, aka strengthening her testimony of the restored gospel of Jesus Christ. after we walked outside, it started snowing with HUGE snowflakes. it was so pretty, and I was feeling so happy and full of the spirit!!! It was awesome!!!! Also, the zone leaders came to our district meeting on wednesday, which means elder carpenter came with cinnamon rollls!!!! holy heck sooo goooood. we finished the lot off today. we got to meet elder pinyon, he is pretty chill and from australia. GOOD TIMES. most challenging? poor sis m not feeling well. also trying not to laugh out loud when people answer the door and just make the worst faces when they see who we are. hahahaha oh man just today I couldn't help but laugh out loud because this girls face was so clearly full of distaste. I loooooooooooove being a missionary!!! RUTH WAS BAPTIZED!! i will forward the pics from sis Harris. Oh what a heavenly and joyful experience for her!!! I love her so much and could not be more full of joy when I think of what a miracle this is in her life. God is so good. Life is just good. Amen. Well , alas, I must go. I LOVE YOU. I love being about the Lord's work. I love this calling. I treasure it! Thank you for the prayers and good thoughts. Have a solid week!! loooooove you alllll!!!! !